It’s important to keep up connections with other people – especially at times of great change. ‘No man is an island’ said the poet, John Donne. Nor can a new building stand alone either. At some point, if it’s to be ‘fit for purpose’ in this day and age, it must join the National Grid. Hence the colourful road-works I had to pass on Tankerville Terrace today as I approached the site for this week’s photographs. A lot of heavy plant machinery was being used today. Once on site, even if there had been more to view today I wouldn’t have been able to. The ground in front of the gates now resembled a muddy battlefield, dissected east to west by a deeply incised trench. 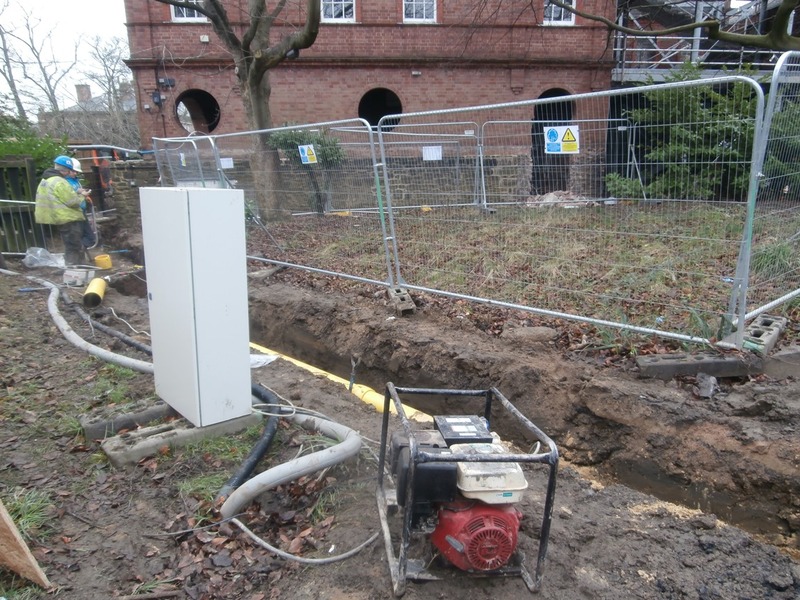 All activity was focussed on connecting the new build to the mains. 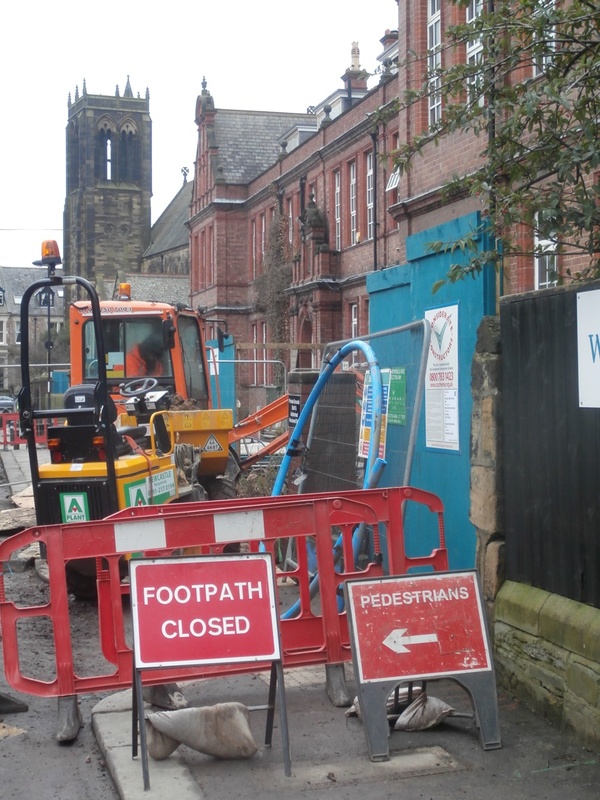 .. as the new building is connected to the gas & water mains. 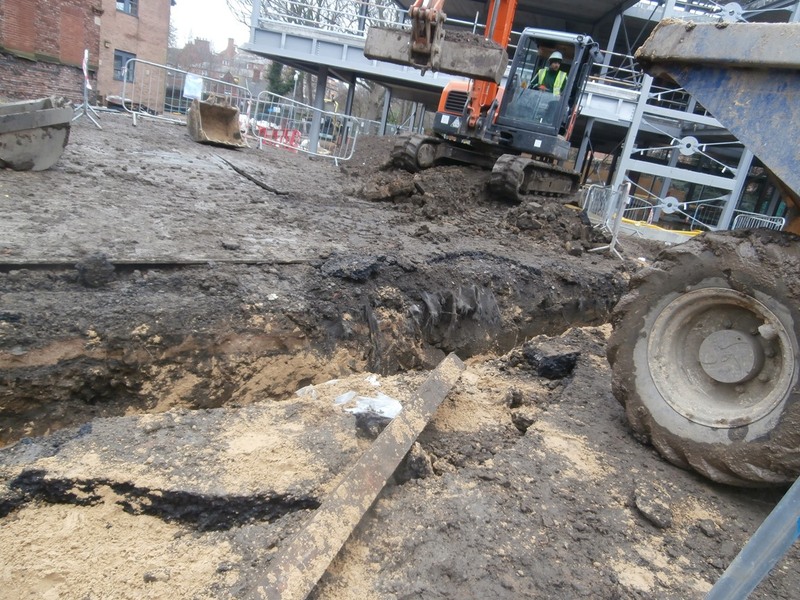 Having fully absorbed the sound of machinery all working in unison and photographed the bright yellow pipeline snaking its way along the newly dug trench to connect up with the new building, a small but very important change to the structure caught my eye. No longer was it just grey steel: two vertical pieces of what I later learned was concrete board, the joins covered by red tape, had been fitted into place since last week. 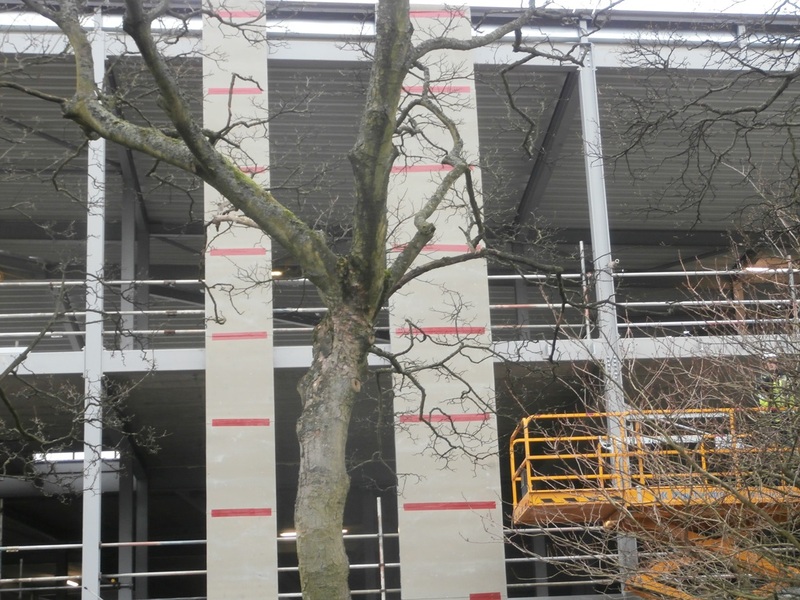 This was really exciting to see as these areas of the building will ultimately be covered by the copper cladding. The first two sections of concrete board are now in place. Elsewhere on site, new connections were also in the process of being made beside the Gateman’s cabin. Nature and wild-life have always been an important part of the Church High site. Apart from birds, early morning workers such as caretakers and cleaning staff have come across foxes and working in the Staff IT Room on two occasions I have looked up at the window and found myself face-to-face with a big grey squirrel happily sitting on a branch of the tree. 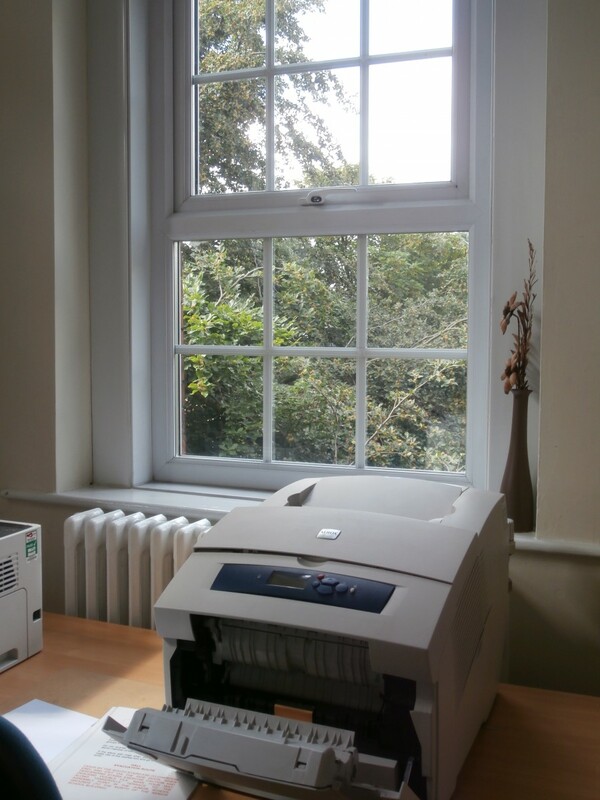 The oldest tree on site allowed a view of squirrels through the Staff IT Room window. 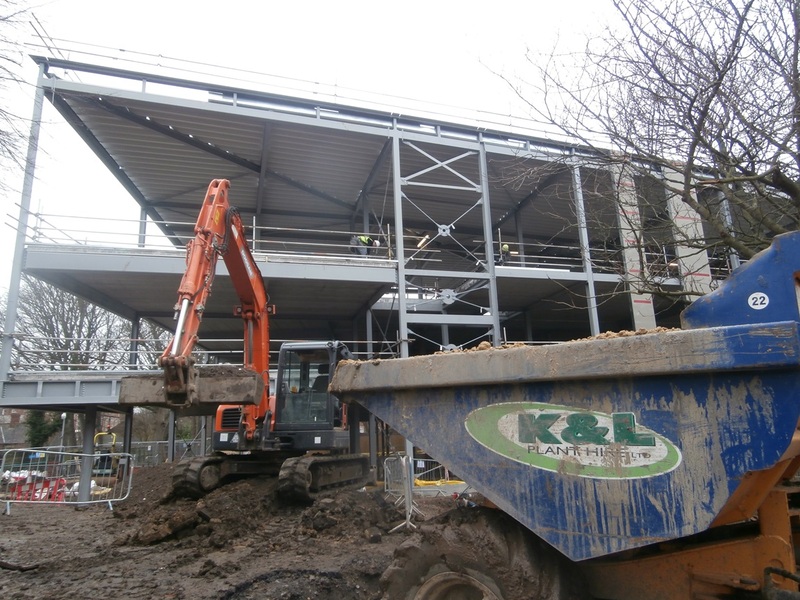 The building work will clearly have impacted on wild-life in the short term, but ‘Tomorrow’s Footprint’ (having a positive effect on the environment) is one of Wates Construction’s ‘Five Commitments’. Because of this, there has been tree protection in place on site from the start, but it was great to see Peter Wilson, Wates’ Gateman, had now erected a bird table in an attempt to lure the birds back again. 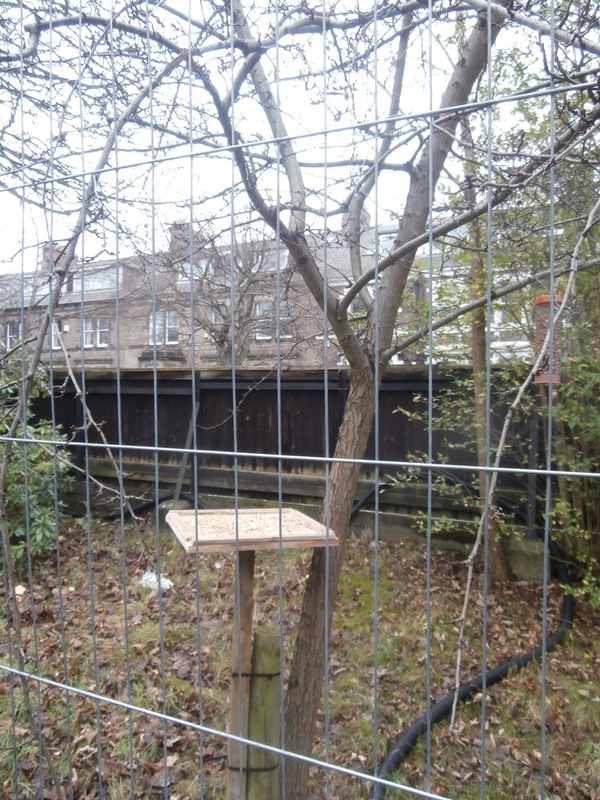 Wates’ Gateman has now built a bird table behind one of the tree preservation fences. From a personal point of view, it has also been wonderful to see how a little ‘niche’ blog has started to connect together folk who love this leafy patch of land on Tankerville very dearly. We are all, in Donne’s words, ‘a part of the main’ and so I thought it might be nice to end this post by sharing with you some inspiring statistics. 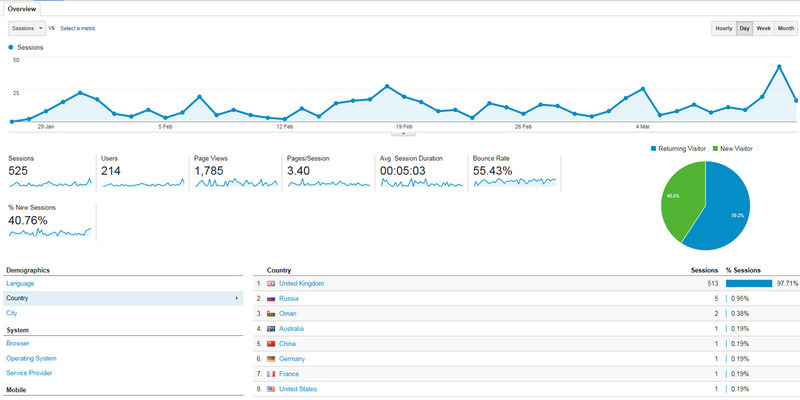 At the time of writing, since January 27th this blog has been visited 525 times, by 214 people in over 50 cities in 8 different countries. Now if that doesn’t show how special this place is, I don’t know what will! 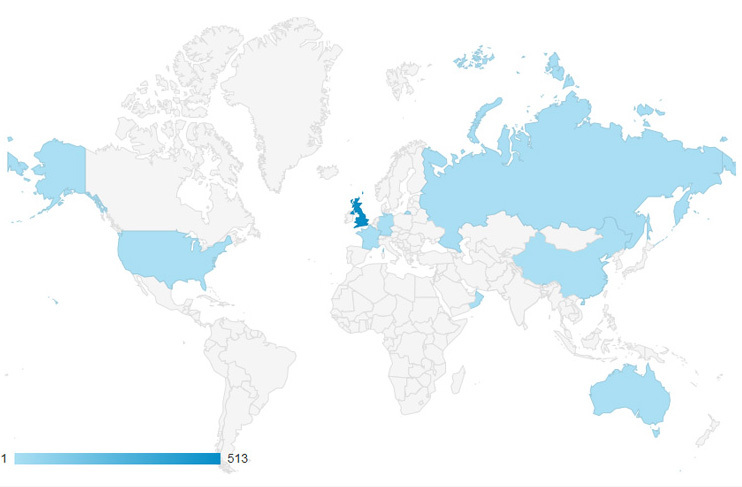 The peaks all coincide with posts about the old building and since Jan 27th the blog has now been viewed in 8 countries. Fascinating to see the progress being made; what a vital record for the archives! Well done, Christine; keep up the good work. For anyone interested in viewing items from the Newcastle High School/Church High School archive for themselves, I’ve recently updated the Background Information page to include a link to the online catalogue via The National Archive and details of the opening hours of Tyne & Wear Archives at The Discovery Museum. It’s a slow process, as you can only request three items at once and view one item at a time, but it really is fascinating to dip into and is well worth a visit.